Here are a few tips for capturing the best fall photos you can this season. Clothes. This is inevitably the very first thing I think of when it comes time for taking fall pictures. It’s easy (for me in particular) to buy ridiculously cute matching outfits for my boys – because, come on. They’re adorable. As much as I love matching outfits, artistically coordinating outfits may be better. Choose clothes in the same color scheme or complimentary colors. If one child is wearing a print, dress the other in a solid, for example. In my mind, my children never own the right outfits for photos and I then I’m off to the store in a panic to find the perfect shirts and pants for the event. The reality is you may not need to buy new outfits at all, and can coordinate something with what you have already hanging in the closet. There are literally hundreds of outfit suggestions on Pinterest that I recommend checking out. Browse the pages to get inspiration about color combinations and layering techniques that will make your pictures look that much more polished. Timing. I’ve had to learn this the hard way. While there are ideal times of day that lighting is best (early morning and sunset) my best advice would be to go during a time when your children are going to be happy. Sacrificing a nap or dragging a hungry child to a photo shoot will not yield good results. Trust me. I’ve been there. I’ve actually paid a photographer a lot of money to take beautiful pictures of my very unhappy child. Mandi Gilliand, of Mandi Gilliand Photography agrees, stating, “My goal as a photographer is to capture fun, spontaneous, raw, as you are, moments that you can cherish forever. “ Try to make those spontaneous and raw moments as joyous as possible! Props. We’ve all seen gorgeous pictures on Pinterest and Facebook of children sitting in a bucket, or on a vintage chair, or on a box during photo shoots. Leave the elaborate props to the professionals and instead work with beauty of the location, or bring a simple blanket, instead. Look for a stone wall, a wooden fence, or simply, the gorgeous fall leaves as an accent. (Check this map to see when fall color is at its peak!) And remember, you can always crop the picture later! Location, location, location. There are some spots that are better than others for fall pictures. Some locations charge annual fees for photographers, but here are our picks for the best free photo op locations and why. Holiday Park – there are a number of features at this park to get different types styles of pictures. Lots of natural “props” such as the stone wall by the garden area, the ruins, the tall grass next to nature center, the fall leaves, and the creek in the woods. Your photo options are endless. Stonycreek Farms – Pumpkin patches and apple orchards are great places to take fall-themed photos but we particularly love Stonycreek. The pumpkin patch is nestled within the farm’s Christmas tree crop, making for a picturesque setting. There are old barns and pond, too , that would make great backgrounds – just be sure to save time to enjoy the farm after pictures, as there’s lots to do! Crown Hill Cemetery – It seems like an unlikely place for pictures but Crown Hill boasts more than 4,000 trees and 555 acres of land and is one of the best places to take in fall foliage in the city. Wherever you are. Some of the best pictures I’ve snapped have been when my kids have been playing outside on their own or while we’ve been out on one of our adventures. I bought a camera that was better than a phone camera and point & shoot, but not as big and bulky as a full blown DSLR, which comes with me everywhere. It’s easy to get caught up in getting the perfect photo instead of enjoying the moments happening right now. Professional photographers are exactly that – professionals. Hiring them to handle the logistics and capture the moments can be the easiest and most enjoyable for you as a parent. Watch for mini-sessions and fall specials from photographers to get a great deal and no headache! 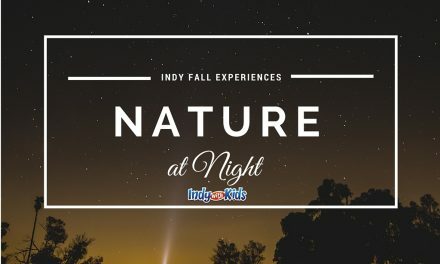 **Our fall photography partners are offering Indy with Kids readers a great deal. Mention this article when booking a session and receive $30 off a session with Memory Lane Photography and $25 off a session with Mandi Gilliand Photography.